Looking for a New Porsche Panamera in your area? CarGurus has 196 nationwide Porsche Panamera dealers with 5,816 new car listings. Porsche is expanding the Panamera lineup for 2018 with the introduction of a new Sport Turismo variant, the automaker's first sport wagon, and a few additional plug-in hybrid trims. Like the Boxster compact roadster, Cayenne SUV, and Panamera 4-door sedan before it, the Panamera Sport Turismo promises to be another game changer for the German automaker. Porsche has concentrated on producing 2-seat sports cars like the legendary 911 for much of its history, but around the start of the 21st century, it made a concerted effort to diversify its offerings and introduced several new body styles. The 2018 Panamera Sport Turismo is the most recent result of that endeavor. While the Boxster and Cayenne were generally well-received by Porsche fans, the debut of the Panamera proved more controversial, due in part to its initial styling. A second-generation redesign in 2017, however, helped smooth out some of the sedan's exterior lines and refine its luxury-oriented features. The new Panamera Sport Turismo builds on last year’s updates by extending the roof rearward to create more cargo room, making it a viable alternative to the Cayenne for those who need some extra space but prefer a sportier drive. With its coupe-like styling, the Panamera’s new Sport Turismo variant certainly makes a design statement guaranteed to turn heads. Its extended roofline gives it a long, low side profile, with distinctive arrow-like shapes at the front and rear. Short overhangs and large wheels add to the unique and sporty look, as does the adaptive extendible spoiler at the back end of the roof. Although it's similar to the adaptive spoiler found on the trunk lid of the Panamera sedan, Porsche notes that it's the first roof spoiler of its kind for the automaker. Depending on the drive mode and vehicle speed, the spoiler will adjust its angle to increase downforce and improve stability as needed during aggressive maneuvers. For normal driving, it focuses on reducing drag, improving fuel efficiency, and minimizing wind noise. The Sport Turismo’s other standard exterior features mimic those of the sedan and include a black slatted grille, slatted lower front air intakes, and LED headlights and taillights. The wagon rides on 19-inch wheels, although larger wheels up to 21 inches in size are available. The Panamera Sport Turismo's redesigned rear end features a tall tailgate similar to the sedan's hatchback, with a low loading edge just 24.7 inches from the ground. Despite the extended roofline, however, cargo space behind the rear seats increases only slightly to 18.3 cubic feet, versus the sedan's 17.6 cubic feet. Overall cargo capacity with the rear seats folded measures 49 cubic feet for the wagon, compared to the sedan's 46 cubic feet. By comparison, the Cayenne offers 23.6 cubic feet of cargo space behind the rear seats and 62.9 cubic feet overall. Compared to the 4-passenger sedan, the Sport Turismo offers better versatility—its second row can seat 3 passengers, a first for the Panamera. The 2+1 second-row arrangement features individual well-bolstered outboard seats with a narrower central bench seat. The seatbacks split 40/20/40 for additional cargo and passenger versatility and can be unlocked electrically from the cargo area. When folded down, the rear seats create a nearly flat loading surface. Buyers can also opt for the traditional 2+2 seating configuration found in the sedan, which consists of 2 power-adjustable individual rear seats with a middle console. For added functionality, the Sport Turismo can be outfitted with a cargo management system for the rear bay with a partition net and tie-down points. The Panamera Sport Turismo variant closely matches the base sedan in its proportions—both have a 116.1-inch wheelbase, a 198.8-inch overall length, and a height of around 56 inches. It joins a crowded Panamera lineup with a wide range of sedan trims, including the Executive sedan variants with a 5.9-inch longer wheelbase. So far, however, the automaker does not offer the Sport Turismo wagon on the stretched Executive wheelbase. In all, buyers can choose from 11 sedan trims (including the Executive trims) and the 4 new Sport Turismo trims, bringing the total number of 2018 Panamera trims to 15. 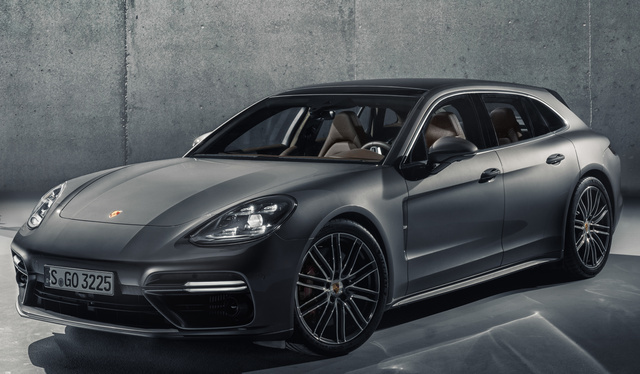 Porsche offers the new Panamera Sport Turismo wagon in four trims, like those of the sedan—the 4 Sport Turismo, the sportier 4S Sport Turismo, the high-performance Turbo Sport Turismo, and the fuel-efficient 4 E-Hybrid Sport Turismo. All come standard with the Porsche Traction Management active all-wheel-drive (AWD) system, and each is powered by a different engine. The 4 Sport Turismo trim is equipped with a turbocharged 3.0-liter V6 good for 330 hp and 331 lb-ft of torque, which also drives the base, 4, and 4 Executive sedan trims. Panameras equipped with the turbo V6 make the run from 0-to-60 in a little over 5 seconds, with slight variations by trim. Fuel-economy numbers check in at 21 mpg city, 28 highway, and 24 combined for the base sedan trim and 21, 27, and 23 for the 4 and 4 Executive sedan trims. EPA figures for the 4 Sport Turismo trim have not yet been released, but they should be in the same range. The Panamera 4S Sport Turismo trim makes a quicker 4.2-second jaunt to 60 mph, thanks to its twin-turbocharged 2.9-liter V6, which generates 440 hp and 405 lb-ft. The 4S sedan is likewise powered by the twin-turbo V6, posting fuel-economy numbers of 21, 28, and 23. Pumping up the power quotient even more, the Turbo Sport Turismo receives a twin-turbo 4.0-liter V8 engine, which boosts horsepower to 550 and torque to 567 lb-ft and cuts the 0-to-60 time to just 3.6 seconds. The Turbo and Turbo Executive sedan trims come with the same V8 engine and make EPA figures of 18, 25, and 21. For a more fuel-efficient ride, the Panamera 4 E-Hybrid Sport Turismo trim, like the 4 E-Hybrid and 4 E-Hybrid Executive sedans, gets the same 300-hp V6 engine as the 4S and 4S Sport Turismo trims paired with a 136-hp electric motor. Together, they produce a total output of 462 hp and 516 lb-ft—enough to propel the 4 E-Hybrid Sport Turismo to 60 mph in about 4.6 seconds. Although official fuel-economy numbers have not been released for any Sport Turismo trims, expect the hybrid powerplant to post numbers of around 25 mpg when driving with the gas engine and around 51 mpg-e in electric power mode alone. It offers a range of about 31 miles before the gas engine kicks in. New for 2018 are two additional Panamera hybrid trims—the Turbo S E-Hybrid and the Turbo S E-Hybrid Executive. Both are equipped with the same twin-turbo V8 as the other Turbo trims and an electric motor, for a total output of 680 hp and 626 lb-ft. The Turbo S E-Hybrid trim stands as the most powerful Panamera as well as the quickest, with a 0-to-60 time of just 3.2 seconds. Aside from the rear-wheel-drive (RWD) base sedan trim, the Panamera lineup comes exclusively with AWD. All engines link to a relatively new 8-speed dual-clutch transmission, introduced in 2017 as part of the model’s second-generation makeover. Other 2017 improvements rolling over to the 2018 Panamera include a revised and retuned chassis and suspension, delivering a good balance of sportiness and comfort. To customize their rides, drivers can choose from Normal, Sport, and Sport Plus modes that adjust the braking, steering, and suspension systems. A 3-chamber adaptive air suspension and electronic roll stabilization are among the standard performance features on the wagon and the higher-end sedan trims. Options include an electronic chassis control management system, rear axle steering, adaptive cruise control, and a sport exhaust system. Beyond the addition of the Sport Turismo variant and new hybrid Turbo trims, the 2018 Panamera carries over from the previous year with no changes. All Panamera sedans and wagons come well-equipped with a range of standard upscale features, including well-bolstered front sport seats, a high-resolution 12.3-inch touchscreen, a digital Porsche Advanced Cockpit with a virtual speedometer and dual 7-inch display screens, a panoramic roof, leather upholstery, and ambient lighting. The Turbo trims get 14-way power adjustment in the front, while 8-way power-adjustable seats are available for the rear. Owners can personalize their Panameras with a wide range of interior colors, trims, and packages, which add such features as 4-zone climate control, ventilated seats with a massage function, and adaptive sport seats. With the introduction of the Sport Turismo wagon to the lineup for 2018, Porsche is making sure it has a Panamera to fit every upscale driver's need. It's also likely the automaker's response to similar luxury sport wagons from its competitors, such as the Audi A4 Allroad, the Mercedes-Benz E-Class wagon, and even the Ferrari FF 4-seater. Each one has carved out its niche in the market, and the new Panamera Sport Turismo is hoping to do the same. What's your take on the 2018 Porsche Panamera? 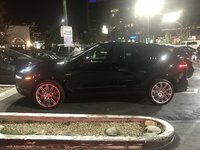 Guru5ZJVS I ordered and have had now a 2018 4S for aprx. 3 months.. Absolutely love this car! Chalk with Black Chalk interior.. I live in Iowa and will drive this car all year long. Have you driven a 2018 Porsche Panamera? Enter your zip to see incentives for a new Panamera in your area. CarGurus has 3,402 nationwide Panamera listings starting at $20,900. 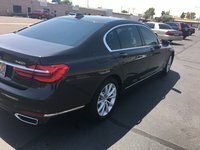 Hello, I must not be able to input my car features correctly because other 2018 cars like mine with similar or less features are priced near or above me. Any suggestions?